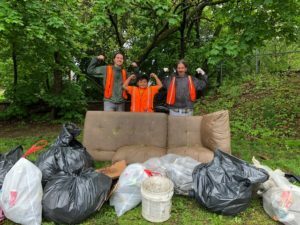 Clean-up of Mile Run Brook in Franklin and New Brunswick! Since its inception in 1970, Earth Day has brought millions of people together to celebrate our world’s environment. The day has also focused our attention on environmental problems such as pollution, flooding and littering. 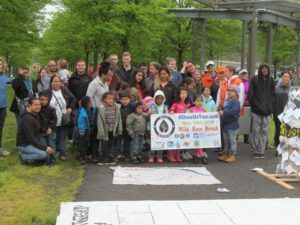 Join the Lower Raritan Watershed Partnership, Franklin Township Environmental Commission, the New Brunswick Environmental Commission, the Watershed Institute, Friends of Mile Run Brook, New Jersey Americorps Watershed Ambassadors and others for an Earth Day clean-up of Mile Run Brook! SPECIAL NOTE: Please wear closed toe shoes and clothes you are willing to get dirty. Bring a reusable water bottle. Gloves, bags and light refreshments will be provided! You may wonder why it is so important to keep our waterways clean. Streams, rivers and other waterbodies make up the watershed where we all live. Watersheds are areas of land where runoff from rain and snow drains into a lake, stream, river or wetland. These watersheds are full of life. They provide habitat for fish, birds and wildlife. They are also a source of drinking water for homes and businesses. 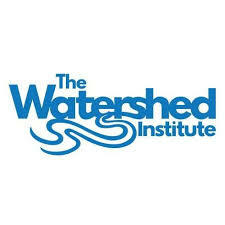 The Lower Raritan Watershed Partnership and The Watershed Institute share a joint mission to keep water clean, safe and healthy through conservation, advocacy, science and education. Visit Lower Raritan Watershed Partnership and The Watershed Institute to learn what we are doing to protect your water. Please plan to join the LRWP and Middlesex County Division of Parks on Sunday February 3, 10-noon for a winter clean-up of the Jamesburg Park Conservation Area in Helmetta! This beautiful area is in the Manalapan Brook subwatershed. We will be cleaning the roadsides along Helmetta Boulevard, Port Street and Washington Street. Meet at the Helme Mill Park parking lot (directions below). ~SAVE THE DATE~ Join the Lower Raritan Watershed Partnership, Central Jersey Stream Team and the Sierra Club for a clean-up of the Green Brook! This Event is Co-coordinated by the Lower Raritan Watershed Partnership, Central Jersey Stream Team and the New Jersey Sierra Club. With special thanks to the Green Brook Department of Public Works for cartage and supplies. Please wear closed toe shoes and clothes you are willing to get dirty. Gloves and bags will be provided! On Tuesday, November 21st of last year, students enrolled in Integrated Reading and Writing (ENG 096) at Middlesex County College (MCC) did something unusual for a typical college course. Rather than meeting in their classroom, they boarded a college van to travel to the Fox Road underpass, a stretch of road off the highway in Edison, NJ. This class excursion was the culminating event following a semester focused on reading, writing, discussing, and learning about environmental issues faced by local communities. 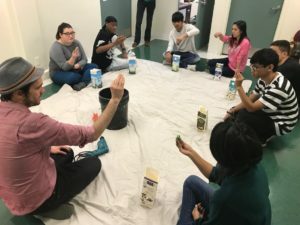 In collaboration with the Lower Raritan Watershed Partnership (LRWP) and the Edison Environmental Commission, students planned and executed a community cleanup service project as part of the greater service learning initiative happening at the College. Students Jessica Colon or Rahway (left) places trash in the bag held by Carolyn Muncibay of Old Bridge. The cleanup involved spending 3 hours of class time bagging trash and recyclables along the underpass. 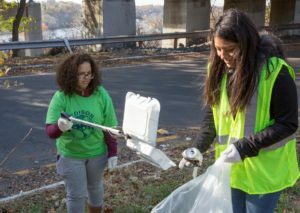 The location of the cleanup was especially significant as it is uphill from the Raritan River. When it rains, trash and other contaminants travel downhill, further polluting the already vulnerable river. 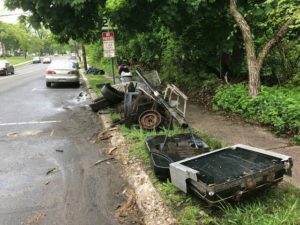 By the end of the cleanup, 17 bags of trash and recyclables, nine tires, a suitcase, car seats, as well as other large trash items were collected. John Keller, Director of Education and Outreach of CoLAB Arts, assists students during the hand sculpture creation process. During the cleanup, students selected one small trash item to bring back to campus. 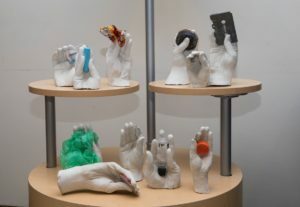 In collaboration with local arts advocacy organization CoLAB Arts, students created cement hand sculptures which are now on display in the MCC College Center in an exhibition titled The Watershed Sculpture Project: Middlesex County College. Each sculpture is of a student’s hand holding the trash item they saved from the cleanup. The display demonstrates the large impact seemingly “small” amounts of littering can have on the environment as a whole, and likewise demonstrates the power of simple acts of stewardship (including stream clean-ups and socially engaged art) to effect positive environmental change. This work seeks to raise awareness of issues of environmental damage happening in the local community, and to prompts viewers to examine and reflect on their own relationship and interactions with the environment. If your non-profit organization is interested in getting involved with service learning at MCC, please contact Arianna Illa, Coordinator of Civic Engagement and Experiential Learning, at ailla@middlesexcc.edu. 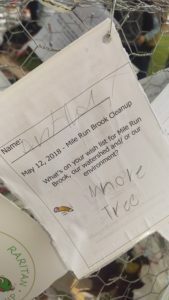 Mile Run Brook Clean-up a Huge Success! 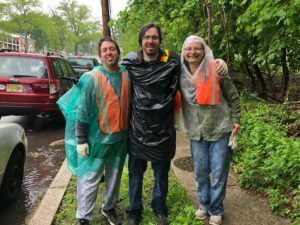 It was a gloomy, rainy Saturday, but on May 12, more than 150 people joined the Lower Raritan Watershed Partnership, Greater Brunswick Charter School, Esperanza Neighborhood Partnership, Friends of Mile Run Brook and Elmwood Cemetery for a multi-site community clean-up and celebration of New Brunswick’s Mile Run Brook. The clean-up was enlivened by our roving “Trash Troubadour” – Dave Seamon – who engaged our volunteers with song and stories as they cleaned-up the stream. 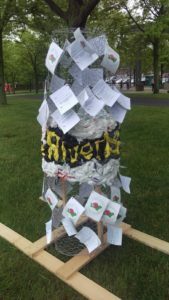 Our Trash Troubadour traveled with a large sculptural bread-and-puppets style bottle (made from trash found during prior clean-ups) that clean-up volunteers covered with messages of environmental hope. The clean-up was followed by a free community celebration and picnic in New Brunswick’s Boyd Park – with delicious contributions of dishes donated by Panico’s Brick Oven Pizza, La Poncena, Harvest Moon, Pizza Mia and Popeye’s Louisiana Kitchen. 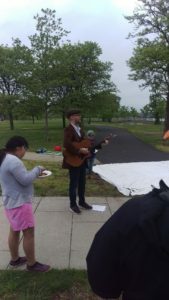 At the end of the clean-up we joined together for a picnic and celebration, the Trash Troubadour created and performed a new song from the messages received. With tremendous thanks to New Brunswick Department of Public Works, North Brunswick Department of Public Works and Rob Hughes, our Americorps Watershed Ambassador for helping with planning, coordination, supplies provision and arranging for disposal of the trash and recycling. Thanks also to the Highland Park Ecology and Environmental Group and Central Jersey Stream Team for bringing your muscle to the clean-up for the day! The Elmwood Cemetery volunteers (coordinated by the New Brunswick Environmental Commission), removed 14 bags of trash and 6 bags of recycling. The Greater Brunswick Charter School removed approximately 1,275 pounds of trash and 720 pounds of recycling. The Esperanza Group removed an estimated 875 pounds of trash and 390 pounds of recycling. The Friends of the Mile Run removed about 400 pounds of trash and 210 pounds of recycling. In addition, 20 bulk items and 6 tires were removed as well. Collectively volunteers removed approximately 2 tons of litter and bulk items from Mile Run Brook! ~VOLUNTEERS NEEDED~ Please join the LRWP, our Americorps Watershed Ambassador and community partners including Friends of Mile Run Brook, Greater Brunswick Charter School, Esperanza Neighborhood Project, the New Brunswick Environmental Commission, Elmwood Cemetery and the New Brunswick Department of Public Works for a multi-site clean-up of Mile Run Brook, culminating in a community celebration in Boyd Park! 9:00 AM to noon – clean-up of multiple sites. 12-1:30 pm community gathering / picnic in Boyd Park. Please wear closed toe shoes and clothes you are willing to get wet and dirty. Gloves and bags will be provided! Help us kick-off the New Year by giving some clean-up attention to Middlesex County’s Johnson Park (Piscataway). Since we last cleaned that area a pair of Bald Eagles has moved in! We’ll stay clear of their nesting grounds, but there is plenty to do in the rest of the floodplain. We will meet 9:30am at the Middlesex County Parks Department offices, and from there caravan to the clean-up site. 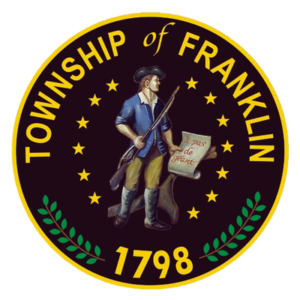 WHERE: Clean-up kick-off at 1030 River Road in Piscataway, Middlesex County Parks Headquarters lobby. This Event is co-coordinated by the Lower Raritan Watershed Partnership and the Middlesex County Department of Parks. With special thanks to Middlesex County for cartage and supplies. Please dress appropriately for the weather. Gloves and bags will be provided! Come out and help Middlesex County Conservation Corps and Clean Ocean Action keep our shores beautiful and debris-free in this annual event held on the Raritan Bay Waterfront! Supplies provide. Registration required. Please contact Griffith Boyd #732.746.3064 or griffith.boyd@co.middlesex.nj.us to RSVP and for more information. What is the most common type of litter in Boyd Park? Is there more paper or plastic in the grass? How many cigarette butts can you find? How many bottle caps? What is the most unusual item hiding in the bushes? 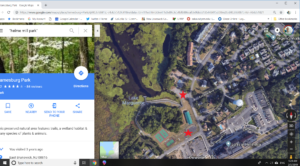 Join the LRWP and coLAB Arts on Sunday September 10, 10-noon for a River Health Workshop and “Scavenger Hunt” Clean-up of New Brunswick’s Boyd Park! This event is coordinated in conjunction with the DIY MARKET at Rock New Brunswick. DIY Market is an open air marketplace that celebrates the creativity and spirit of the New Brunswick music scene. It is being held in Boyd Park, alongside a day-long homegrown New Brunswick music festival. The LRWP, coLAB Arts and the Raritan Headwaters Association are co-hosting a special Earth Day clean-up of New Brunswick’s waterfront on Saturday April 22. Please park in the New Brunswick Landing Parking Lot, located at the crossroads of Route 18 and New Street (see directions below). There will be signs up to direct folks to the clean-up site, where there will be a table set up with sign-in forms, bags, gloves, etc. Volunteers should dress for the weather, and be prepared to be outdoors.